PHILADELPHIA (AP) — An estate sale at the home of polarizing former Mayor Frank Rizzo went like gangbusters over the weekend — and just after it wrapped up, an additional treasure trove of personal items was discovered in the attic, including phone numbers for Frank Sinatra and Richard Nixon, the agent in charge of the sale said Monday. About 40,000 people came through the estate sale, which started Friday and wrapped up Sunday afternoon, said John Romani, who runs Sales by Helen with his mother. Many were police officers and firefighters and ordinary citizens who came to pay their respects, to chat with Rizzo’s son Frank Rizzo Jr., and maybe leave with a trinket or two, he said. Photographs, sweat shirts, suit jackets and Christmas decorations all went. “To a lot of people it was a pilgrimage, an opportunity to say goodbye one more time,” he said. Lots of selfies were taken in the bedroom, he said. Top sellers were Rizzo’s single-digit license plate ($5,000) and Rolodex ($2,500), bought by the same man, who all told spent about $11,000, Romani said. A number of billy clubs were up for grabs and went for $1,250 to $1,500, but none was the one the tuxedo-clad Rizzo stuck into his cummerbund when he was police commissioner during a disturbance at a housing project in the 1960s, immortalized in a photo. Rizzo’s wife, Carmella, died in July at age 101, and the family wanted to sell the house and clear it out. 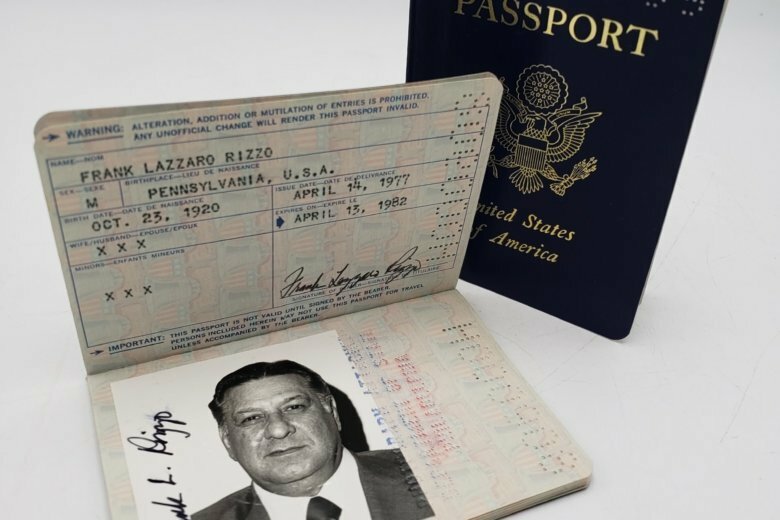 Philadelphia has long tried to reconcile the complicated legacy of Rizzo, who served as mayor from 1972 to 1980 and died in 1991. His friends, family and fans remember him as a devoted public servant unafraid to speak his mind. His detractors saw his police force as corrupt and brutal and said Rizzo alienated minorities both as police commissioner and mayor. After the estate sale wrapped up Sunday, Romani said people going through the house stumbled upon about 20 boxes in the eaves of the attic, containing what Romani called a treasure trove: Rizzo’s gold watch, more Rolodexes (including one with Frank Sinatra’s number), his signed oath of office from 1971, his passports, a gun permit and an unopened box of cigarettes from Air Force One. Also found was what Romani calls Rizzo’s “little black book.” The well-worn booklet has handwritten contact information that reads like a who’s who of the 1970s, including Richard Nixon’s phone number. Romani estimates about 50 to 100 historically significant items were found after the sale wrapped up. The priority now, he said, is selling the home in the city’s leafy Chestnut Hill section. It’s on the market for $1.695 million. The newly discovered items and some of the pieces that didn’t get snapped up in the estate sale will now head to auction Jan. 29 at Uniques & Antiques in Aston, Pennsylvania, he said.